Find out how to distinguish yourself with magazine-quality portraits using these pro tips from author and professional photographer Kirk Tuck! Plus, enter today for your chance to win his online Craftsy class, Studio Portrait Lighting, and gain the equipment, setup and lighting techniques to improve your next portrait photo shoot immediately! 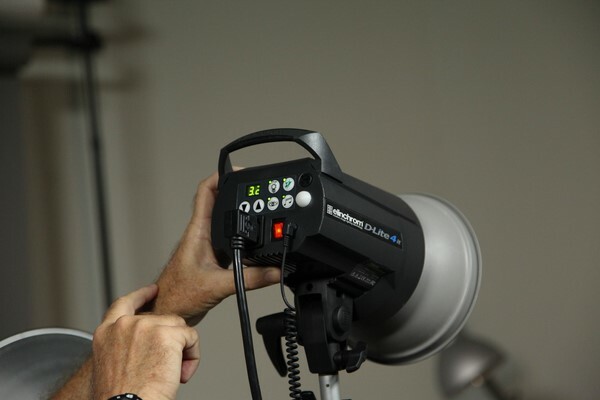 Use bigger light modifiers further back as this allows for good lighting coverage. Most full-lengths seem to be against white backgrounds which takes a lot of fussing to get just right. Try a 4×6-foot softbox for an even distribution in the front light and then a light source rear lighting your subject as well; these are in addition to evening lighting across the white backgrounds. Use large light modifiers or soft boxes set back from your subject for good, even lighting coverage. Try a 4×6-foot softbox for an even distribution in the front with a secondary light source behind your subject to define edges and give a few highlights. If you’re going to be hand holding a camera, make sure to select a shutter speed that won’t introduce any camera shake. When in doubt, use the old rule of thumb and never use a shutter speed that is slower than the focal length of your lens. For example, if you are using a 50mm lens, don’t go lower than 1/60s. When using flash you can decide whether or not you want the ambient light to have a strong effect. If you want your finished image to contain both flash and ambient light, set your shutter speed slower than the synchronization speed, (generally 1/250s) and “drag” the shutter. The slower shutter speed allows the flash and ambient lighting to mix. If you only want the flash to show, aim for a shutter speed closer to the synchronization speed of your flash. Your shutter speed is your most important setting if you want to stop action or show movement. For sports or fast movement, use faster shutter speed to freeze your subject in the middle of the action. Compensate for exposure by using larger apertures and higher ISOs. The first thing you should do is “zero out” your camera and set all the controls from scratch. If you’re shooting anything longer than 85mm and you’re not trying for the slimmest depth of field try f/5.6. Lenses are sharpest there (or at f/8) and you should be able to get sharp focus from the subject’s nose back to their ears. When shooting commercial portraits, it is best to use strobe lighting so that you can use your full film speed range (ISO). Set your ISO to the lowest you can to maximize your image quality and reduce noise. Umbrellas that have silver linings tend to reflect a more heavily contrasting light than the white umbrellas. The advantage of the silver umbrellas is that they are more efficient and you get more light out of them at the same power setting. Nowadays we don’t worry much about a lack of power but you should think about keeping your light source soft and flattering. If you can only buy one version, go with the white. Need more contrast? Move the umbrella further away from your subject. When a customer is wearing clothing that conflicts with the background and doesn’t have a change of clothes, one solution is to change to a different color or style of background or simply switch to a white background. Ultimately, it’s important to consult with clients prior to their appointments and really discuss what to wear and why. If you let them know what colors are slimming and flattering and what’s not you can help them prevent a less than happy session. Ask for clients to wear subdued, solid colors, for example a long-sleeve, gray knit shirt with a crew neck or an actual collar. This will allow the viewer to focus on their face (the important part!) instead of their clothing and will also help to avoid portraits looking dated. Most cameras have a self-timer mode that you can use to employ yourself as your own model so that you can shoot and experiment to your heart’s desire. The benefit is that you are available all the time and you probably take direction from yourself pretty well. Stick a light stand in the shot where you intend to stand, put the camera on manual focus to lock in focus on the light stand and then trigger the self timer and walk on over to where the light stand is. Then move the light stand and get a nice test shot. Once you have the focus determined you can put a spot on the floor and get repeatable focus. You can use an infra-red remote or a long cable to trigger the camera instead of the self-timer. 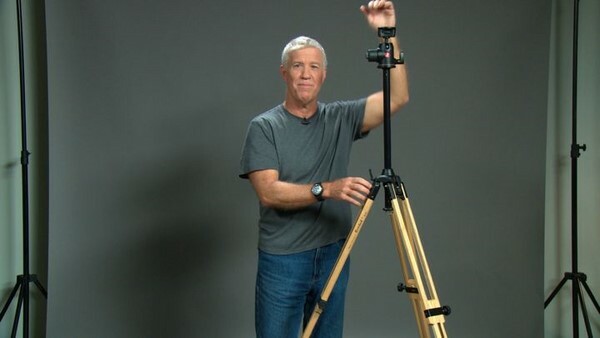 It is more convenient and you can try multiple poses before heading back to the camera to see what you got. Another cheap and easy idea is to get a used manikin as a model; you can dress it up any way you want. Now go beyond these pro tips with Kirk Tuck’s online Craftsy class Studio Portrait Lighting (a $29.99 value!). Enter for your chance to win here, and gain the skills to capture the perfect shot every time, including fun senior photos, professional business profiles and compelling artistic shots. Kirk will even critique your photos and answer any questions you have. And, since you’ll own your class forever, you can learn at your preferred pace and revisit techniques before your next shoot. What are some of your favorite tips and tricks for shooting portraits? Commercial photographer Kirk Tuck has photographed President Bill Clinton, Academy Award winner Renée Zellweger and more. He’s also authored five books including Photographic Lighting Equipment: A Comprehensive Guide for Digital Photographers and Commercial Photography Handbook: Business Techniques for Professional Digital Photographers. One winner will be randomly selected on April 7th 2014. This has been a sponsored post kindly brought to us by Craftsy.